Heinzmann is a painter in the emphatic sense of the word, fully invested in reinventing and recalibrating that medium’s capacities, while keeping a keen eye on that artform’s rich history. One of the central tenets of Heinzmann’s work lies in revisiting painting’s Western tradition with both of its prime historical momentums in view: painting as the superior medium for showing the world; and, after it had achieved its momentous triumph in retreating to its own means, painting as the field for a powerful interaction of form, color, texture, surface, after the rupture of abstraction. 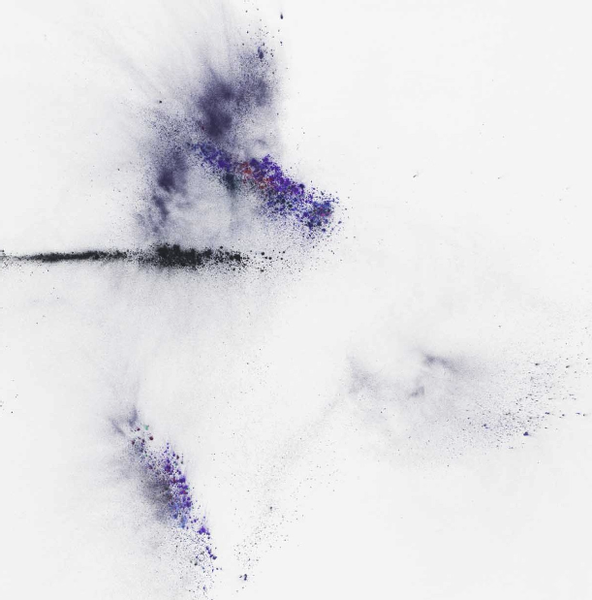 Heinzmann’s work revisits this epochal break and harnesses it into a dichotomy that his art elegantly puts into play. His works with pigment, for example, display that powdery dust, they exhibit it in its material concreteness, as one of the many specimens of matter that make up our world; but they also transform it into chromatic fields, exploring its wide yet subtle palette, letting color perform as it should after it has been freed of the burdens of representation. What matters here is, in other words, that what has been influentially described as painting’s “Task of Mourning” (Yve-Alain Bois), or its various endgames, are, in Heinzmann’s work, combined and in that combination release a new productivity. Many ends of painting have been called: showing the world, displaying pure form or color among them. Heinzmann’s paintings make the case that neither end is finite, and that this artform can powerfully deliver its riches when holding both options in balance, and turning that balance into a play that makes for modulation of and meditation on painting’s capacities. “We, Rivers & Mountains” is an exhibition of eight new pigment paintings where landscape assumes a definite form in the relation of heaven and earth; in suspense, as it were, space is opened up for the intimation of human presence. The landscapes in the exhibition refer to the significance of this subject matter within the history of Western painting. Influences from East Asian art also come into play in accordance with their impact on various art-historical epochs. In “We, Rivers & Mountains” the viewer is confronted with the universal idea of landscape. Changing perspectives on diverse horizons are opened up in the physical space of the gallery. In her or his own movement the viewer animates landscape after landscape, thus taking an active role in a subtly nuanced and pointed space of reflection.